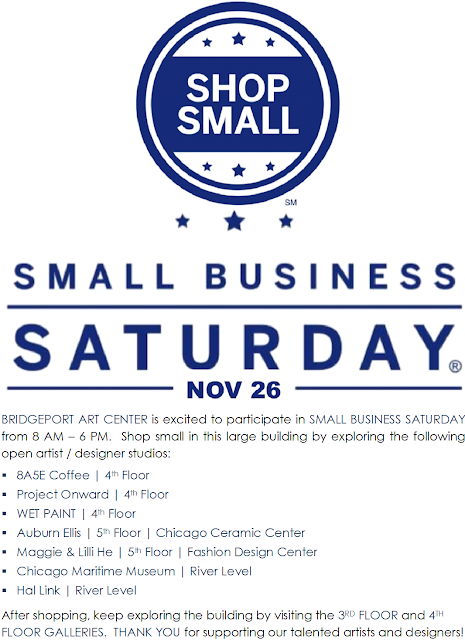 Small Business Saturday - Chicago! For those of you looking to support local businesses in Chicago, check out these great ones at the Bridgeport Art Center. A hub for creatives in the City, you'll certainly find some one of a kind items at this spot. The space is inspiring in itself. You've met the ladies of Noisemakers, but don't forget to continue spreading the word of support for this awesome project. We are so excited to promote Shut Up Silence, an awesome film on the fall-out from abusive relationships on college campuses. The fabulous female filmmaking trio is making waves with this project, and have launched an Indiegogo campaign to continue driving support. Over the next three months, the women have set a fundraising goal of $250,000. “This is my story. I’ve lived this, and now I can’t hold it in any longer,” said Natasha Parker, award-winning writer/director and one of the founding partners of Noisemakers Entertainment. The film, titled “Shut up Silence,” takes place in a university setting where the lead character finds herself in a relationship with her college sweetheart that seems impossible to walk away from. A rollercoaster of events, including ignored abuse, lead to a critical choice she must make between freedom and love. Noisemaker partner LaTrice Edwards couldn’t agree more. Edwards, a celebrity makeup artist and philanthropist looks forward to the film “Shut Up Silence” becoming a reality and intends to add her creative touch. “Not only do we feel compelled to help Natasha tell her story, but we want to save lives too,” said Edwards. Pending the success of the Indiegogo campaign, filming is set to begin in the spring of 2017. To learn more about or contribute to the campaign, visit the Shut Up Silence Indiegogo page. For more information and updates about the film, visit Noisemakersentertainment.com and follow the Noisemakers on Facebook, Twitter, and Instagram using the hashtag #ShutUpSilence. To interview the Noisemakers, email clstalling@yahoo.com. Share your support for them on social media! We've gotten you all excited about the Shut Up Silence film project, to help end the silence about domestic violence. While you share your support for the project on social media, learn more about the awesome ladies behind these project. Noisemakers Entertainment’s purpose is to create and develop unique diverse stories through film that entertain, empower and stir the human spirit while providing creative outlets and platforms for industry talent. Natasha Parker is a writer, director and producer raised on the West Side of Chicago. Parker graduated from the University of Illinois at Urbana-Champaign with a B.A. in Speech Communications, with a minor in African-American Studies. Working various corporate jobs after graduation, her true passion guided her towards filmmaking. With continued studies at the Independent Screenwriters Group, she began a career in the entertainment industry in 2004. In 2009, Natasha created Noisemakers Entertainment and co-founded the company. Writing, directing and producing two shorts in three days, “The Package” and “The Lost One” have garnered the attention of the Library of Congress, competed in the Martha’s Vineyard HBO short film series, Urban World, Pan African Film Festival, Black Harvest and a nominee for an African Movie Academy Award in Nigeria. Balancing the dual hats as an independent filmmaker and studio craftsman, Natasha learned the skilled professions of wardrobe, props and coordinating for various departments becoming a proud member of IATSE 476. Reaching further, Natasha strived for and earned the title of Location Manager joining the esteemed Director’s Guild of America. Her credits range from films such as Transformers 3, Empire, Man of Steel, Chiraq, as well as a multitude of television shows and commercials. Gary, IN native, LaTrice L. Edwards’ industry experience started in 2001 as a make-up artist. The I.A.T.S.E. Union members’ (Studio Mechanics Local 476) work has been seen on several A-list Films, TV shows and celebrities. However, her tugging interest in film producing never allowed her to let go of her business roots in Corporate America. Edwards’ philanthropic efforts as founder of Triumphant Transitions, Inc. (www.triumphanttransitions.org) have been recognized by several media outlets, including CBS 2 News Chicago. The recipient of a B.S. Degree in Fashion Merchandising and Marketing from Ball State University, Edwards is also the creator/designer of Power Style Tees (a charitable empowerment t-shirt initiative of Triumphant Transitions, Inc.) The Ball State University Alumni Association honored Edwards in 2007 with the Alumni Award of Achievement, in recognition of her professional accomplishments and voluntary service. Edwards is a 2011 life membership inductee of the Northwest Indiana Society of Innovators. She is now combining her passion, corporate and film experience for the greater good of creative arts with Noisemakers Entertainment, LLC. Chicago native, Adrienne Swan, is a consummate professional with 20 years of experience in Production Accounting. She is a member of the IATSE Union for Accountants both in Los Angeles and New York. Her experience is sought after by the industry on both the major studios and independent film level with over 30 credits in her filmography. Adrienne’s degree in Accountancy from the University of Illinois at Urbana-Champaign, coupled with corporate experience, has more than prepared her for a successful career in the entertainment industry. In recent years, Adrienne has added Line Producer and Production Management to her industry experience. In addition to her commitment to social advocacy and youth empowerment, Adrienne is an active member of Alpha Kappa Alpha Sorority, Inc.
To learn more about or contribute to the campaign, visit the Shut Up Silence Indiegogo page. For more information and updates about the film, visit Noisemakersentertainment.com. Follow the Noisemakers on Facebook, Twitter, and Instagram using the hashtag #ShutUpSilence. To interview the Noisemakers, email clstalling@yahoo.com.